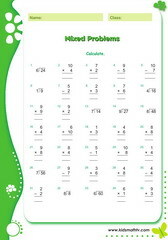 Mixed operations worksheets for young learners from 1st to 7th grades. 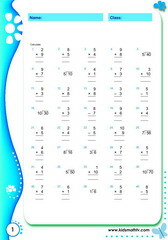 Each worksheet is a printable pdf file with tow pages, the second being an answer key. 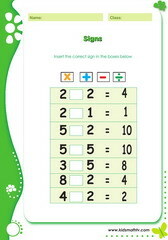 These presence of an answer key makes these worksheets easy for testing skills by parents with little math skills, by teachers who wish to set a math test and by students who need to be sure as they study along. 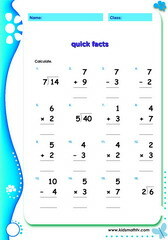 Skills to test include: addition and subtraction problems, math exercises combining several operations like addition, division, multiplication etc, balancing equations and more. 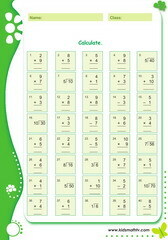 Printable math tests here on mixed operations can be done after watching videos on this site as well as can be played alongside relevant games. Print and practice. 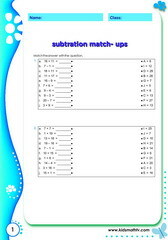 Practice Addition subtraction matchup drill with this worksheet. 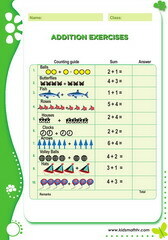 Practice Addition with pictures sums with this worksheet. Practice Find signs to make equations balance with this worksheet. 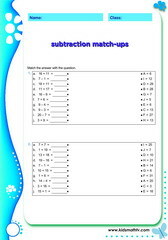 Practice Mixed addition division subtraction exercises with this worksheet. 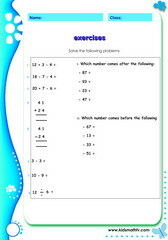 Practice Mixed operations with this worksheet. Practice Mixed addition subtraction multiplication1 with this worksheet. 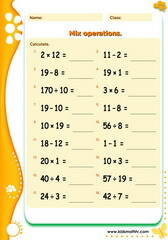 Practice Mixed addition subtraction multiplication2 with this worksheet. Practice Mix operations with this worksheet. 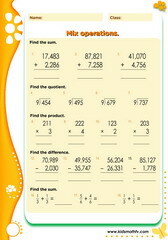 Practice Mixed operations/mix operations with this worksheet.